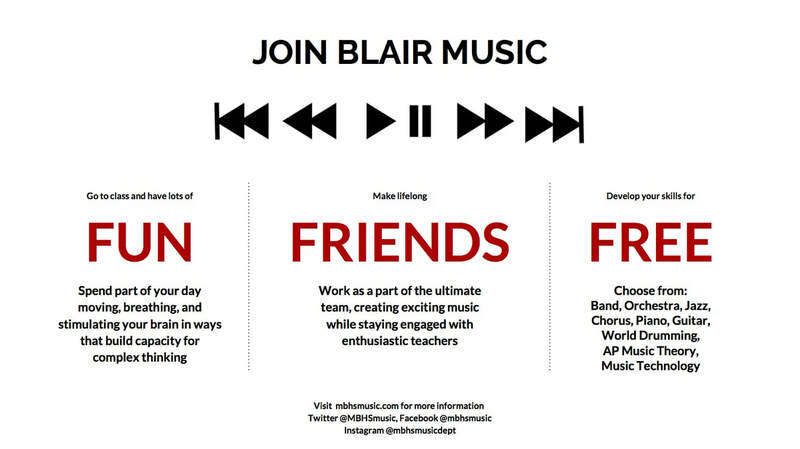 Incoming freshmen and students who are not currently enrolled in a Blair Band class who wish to audition for Symphonic Band or Wind Ensemble in the 2019-2020 school year should sign up here. Be sure to visit our audition page for more information! ​Swingin' Sounds for Senior Citizens! Visit carnival.mbhs.edu to share pictures from the event. Miss the incoming 9th Grade Orchestra and Jazz Auditions? There will be ONE more opportunity to audition on May 17. ​will perform at the NAfME Eastern Division Conference in Pittsburgh this April! Join the Blazer Pride Marching Band for the 2019 season! To arrange an audition for Chorus 2, Show Choir or Chamber Singers, please contact Mrs. Hernandez-Cata at isabel_hernandez-cata@mcpsmd.org, view details at this link and fill out this form. Click Here for Online Music Program Registration!